A recent study commissioned by the Office of the Assistant Secretary for Planning and Evaluation has found that large employer-based plans made substantial changes to their benefit designs in response to enactment of the Wellstone-Domenici Mental Health Parity and Addiction Equity Act (MHPAEA) of 2008 and issuance of the interim final rule (IFR). Most plans removed most financial requirements that did not meet the requirements of the federal parity statute and its implementing the IFR. In addition, the number of plans that applied unequal inpatient day limits, outpatient visit limits or other quantitative treatment limits for mental health or substance use disorder (MH/SUD) coverage had dropped significantly by 2011. Differences in cost-sharing for prescription medications and emergency care also declined, and by 2011 practically all large employer-based plans studied appeared to comply with MHPAEA for those benefits. These shifts in benefit design were made without major disruptions in other aspects of MH/SUD or medical/surgical coverage. Only 1%-2% of employers dropped MH/SUD coverage and some evidence suggests that plans did not exclude more MH/SUD diagnoses from coverage in response to MHPAEA. There is no clear evidence that the small number of plans that did drop MH/SUD coverage did so because of MHPAEA, or that plans or employers reduced medical/surgical benefits to comply with parity requirements. However, there is room for improvement. A minority of large employer-based plans -- one in five -- still required higher copays for in-network outpatient MH/SUD services than for comparable medical/surgical benefits in 2011. This study also examined in less detail the use of non-quantitative treatment limits (NQTLs) as defined in the IFR implementing MHPAEA. Although fully assessing compliance with parity requirements for NQTLs was outside the scope of this study, the report did identify some areas of concern. For example, in a number of cases, plans in this study appeared to use more stringent precertification and utilization management controls for MH/SUD compared to those used for medical/surgical benefits. The methods used by health plans to set provider reimbursement rates for MH/SUD services sometimes did not appear to be consistent with the plans' methods for setting rates for medical/surgical care providers. This Brief was prepared by the U.S. Department of Health and Human Services, Office of the Assistant Secretary for Planning and Evaluation, Office of Disability, Aging and Long-Term Care Policy. 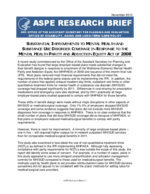 For additional information about this subject, visit the DALTCP home page at http://aspe.hhs.gov/office_specific/daltcp.cfm or contact the author, Kirsten Beronio, at HHS/ASPE/DALTCP, Room 424E, H.H. Humphrey Building, 200 Independence Avenue, S.W., Washington, D.C. 20201, Kirsten.Beronio@hhs.gov.